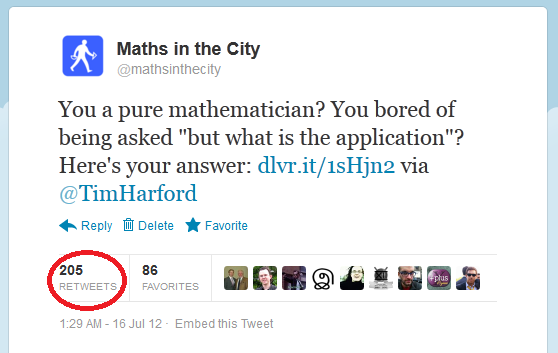 The Maths in the City is a public engagement project that, in short, went really well. There are many factors that contributed to its success and in this post I shall share the secrets behind our effective public engagement through social media. This is the classic institutional mindset, all forms of engagement being ‘broadcast’ to a public ‘out-there’ from behind institutional lines. Our approach was de-centralised and more conversational. The offline activities promoted online ways to engage and vice-versa. This created a virtuous circle and a kind of many-to-many relationship between all of our activities. This was supported by a project team with overlapping skills and responsibilities (i.e. we all moved ideas and items around the loop). Key to this approach was constantly ‘drawing-in’/responding to opinions and artefacts from the public and the co-production of materials with our group of student tour-guides. This we felt was a more honest form of engagement and in keeping with the conversational tone of social-media. 1) Tone. I went for a fun, slightly irreverent tone while also expressing a wonder for the beauty of mathematics. I adopted this tone based on what I observed to be the majority tone adopted by maths communities on Facebook and Twitter. 2) Content. I only had a basic background in mathematics. However, I found that the ability to find funny and interesting material was more important than depth of knowledge. In the first year I relied on posts/tweets from others in the maths community, pictures of the project mascot (Maths Dave) and, I am not too proud to admit, Google searches. In the second year of the project, a group of student volunteers got involved and they added a layer of further interest by setting puzzles and teasers for people to solve. 3) Message. The majority of tweets and posts communicated the joy of mathematics and included a push to the project website when relevant. We found that this maintained a sense of community and presence, which in turn led to a swift response to any project-specific news and calls to action. 4) Frequency. In the first year of the project, I tweeted three times a day and posted on Facebook every 1-2 days. Initially, I set aside 15 minutes every morning, lunchtime and afternoon in which to tweet/post content. This time got less as I identified reliable sources for content. In the second year, I visited the project Twitter feed and Facebook page just once a day as student volunteers contributed to content. 5) Critical mass. We wanted to get our follower numbers on Twitter into the hundreds and ‘likes’ of our Facebook page to 100 as soon as possible so that we could get the flow of communication going. 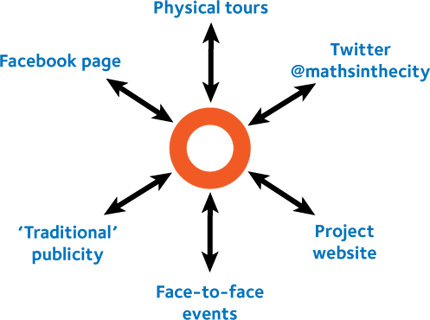 In the first month of launching our Twitter feed and Facebook page, friends of the project who had significant followers of their own were asked to publicise the project and encourage their followers to follow/’like’ Maths in the City. They were happy to do so because they were asked by people whom they respected and we had already placed strong content in our Twitter feed/Facebook page. 6) Volunteers. Volunteer students from the University of Oxford were an important part of the project deliverables and we had a pool of talented and motivated students who were passionate about sharing their love of maths with the public. Some of them did not have time to participate in the face to face aspects of the project so our social media channels provided them with a volunteering opportunity that fitted in with their study commitments. Those who joined the online public engagement team helped to double follower numbers in the second year of the project. 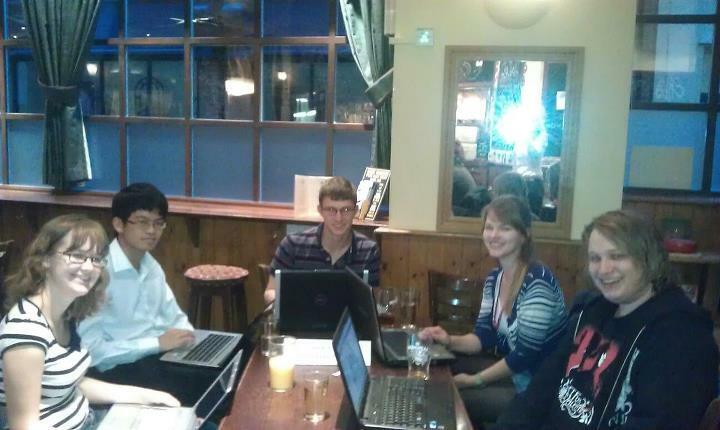 We meet in the pub because there is free wifi. There’s no other reason. Now what’s the budget code for a pint of bitter? They could either use the project Twitter account or their own and if using the project account, they followed some simple guidelines regarding the tone, message and purpose of their activity. Becoming the voice of the project or interacting with the project under their own accounts seemed to contribute to the volunteers’ sense of ownership of the project. 7)Sustainability. We put a lot of thought into making sure Maths in the City had a life after the end of the project. The student volunteers who have been an integral part of this project are part of Marcus’ Marvellous Mathemagicians, a public engagement team run by the University of Oxford’s maths department. Their social media networks are small so the project Twitter feed and Facebook page will be repurposed so that they can take on the networks established by the project to support their own public engagement activities. So that’s how we did public engagement through social media. This is part of a series of blog posts which discuss our approaches to public engagement on the topics of; teaching/public delivery of complex material, what makes the public participate in public engagement initiatives and the management/encouragement of volunteers. 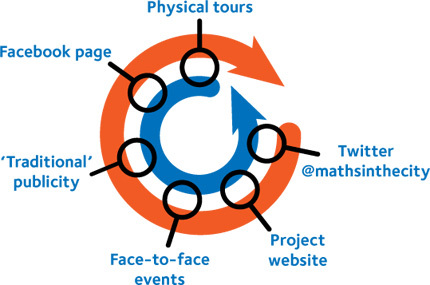 There’s even an intro post that gives an excellent overview of the Maths in the City project. (Dave White made me say that.) If you find any of these posts useful, let us know by commenting below or dropping us a line on Facebook and Twitter. This entry was posted by tindalls on Tuesday, September 25th, 2012 at 7:44 am	and is filed under community, creative commons, EPSRC, Maths in the City, OER, Open Educational Resources, public engagement, teaching and learning, Uncategorized. You can follow any responses to this entry through the RSS 2.0 feed. Both comments and pings are currently closed.